Visitors looking at the Multiplex and planning their visit. 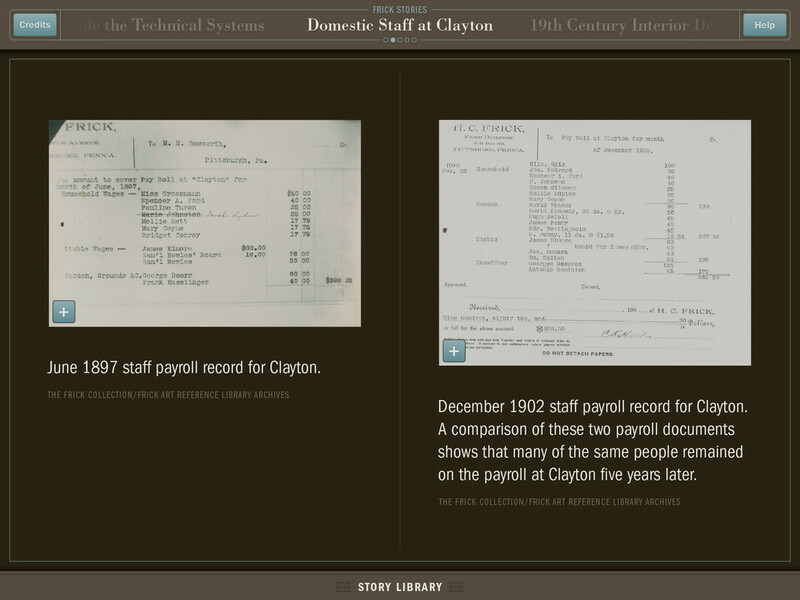 A screen from the Multiplex featuring the day's events and tour pricing / information. 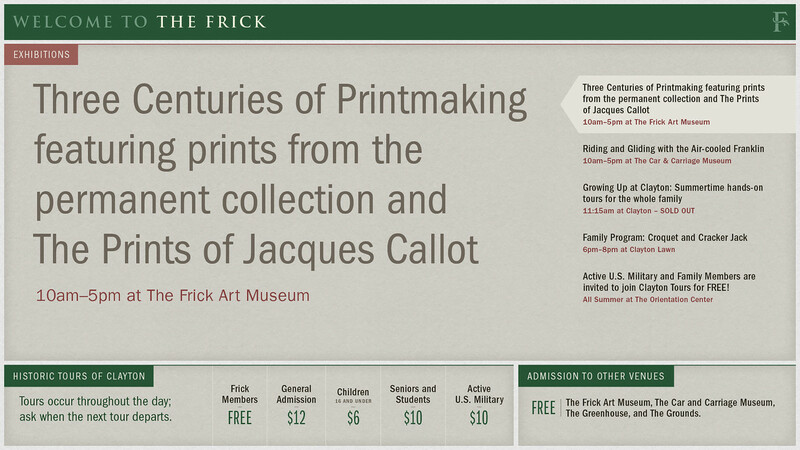 A screen from the Multiplex featuring venues at The Frick and membership information. 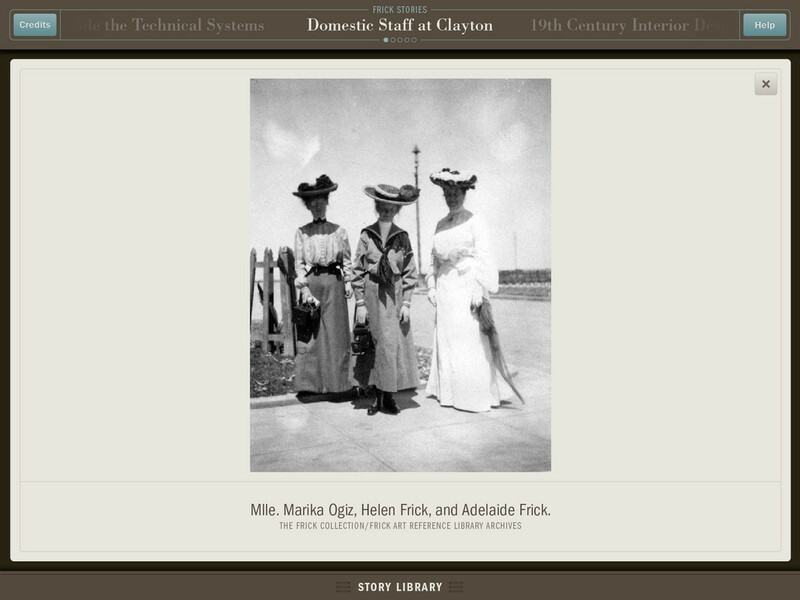 A screen from the Multiplex featuring objects in the collection that are on view and membership information. Visitors exploring the Interactive Map. 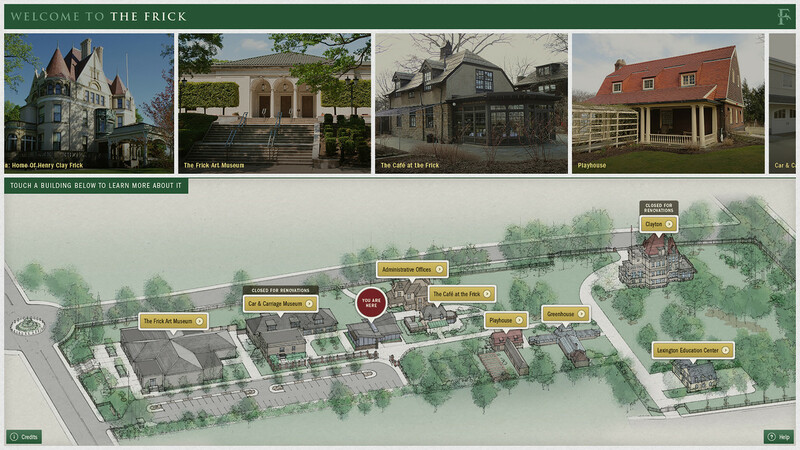 The Interactive Map showing the Buildings and Grounds at The Frick. 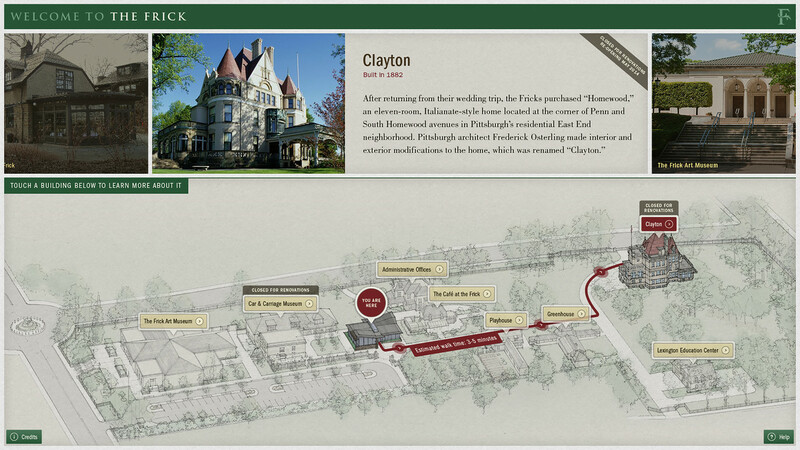 The Interactive Map showing the route and walking time from the Orientation Center to Clayton. 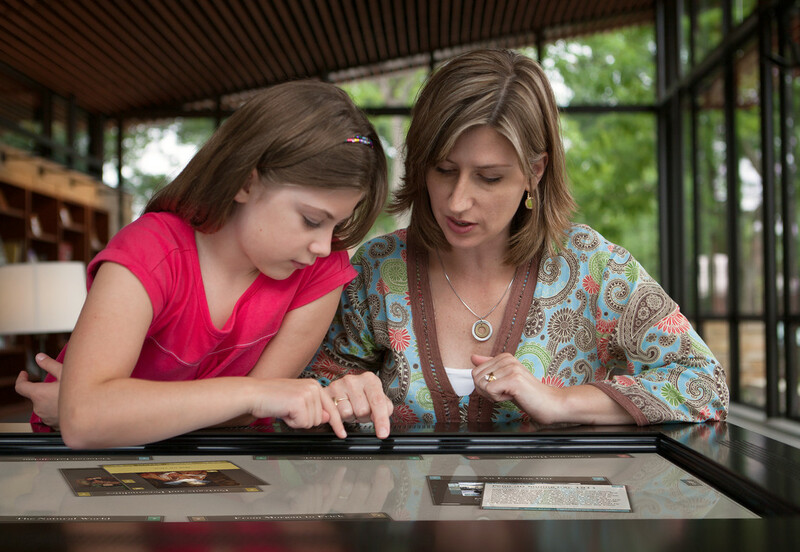 Visitors using the Collection View Touchtables. Visitors are exploring the various categories and the objects inside them. Visitors selecting a story to read. 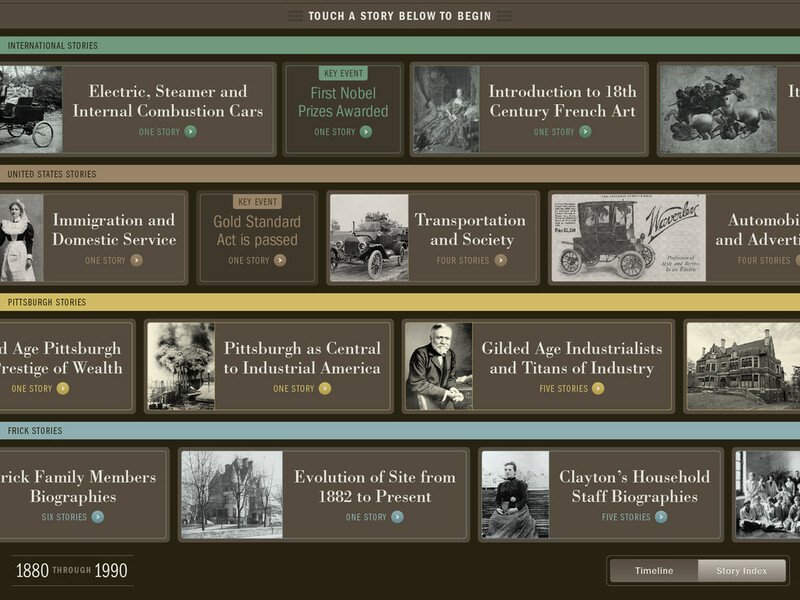 Stories are organized in two views; this represents the Timeline view. 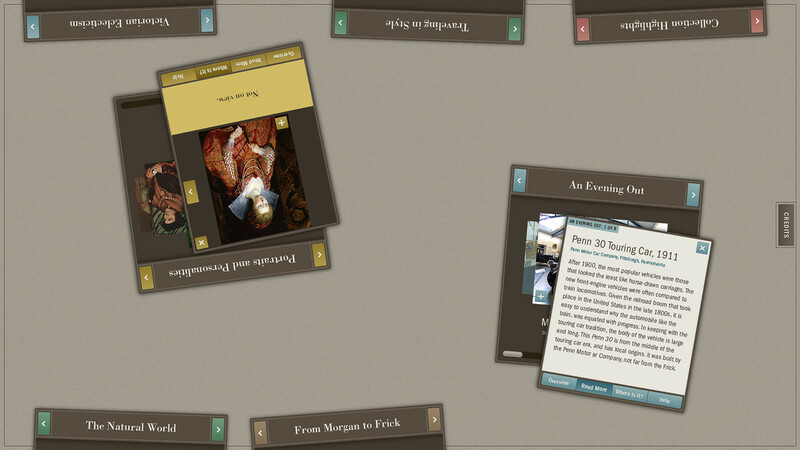 Stories are organized in two views; this represents the Story Index view. Visitors using the Story Viewers. 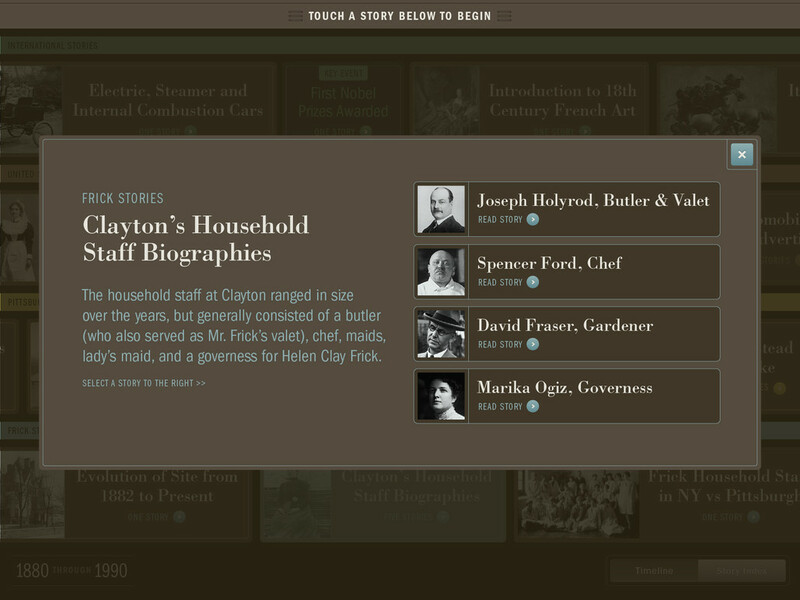 Related stories can be grouped into Story Groups. A story featuring longer narrative passages of text. 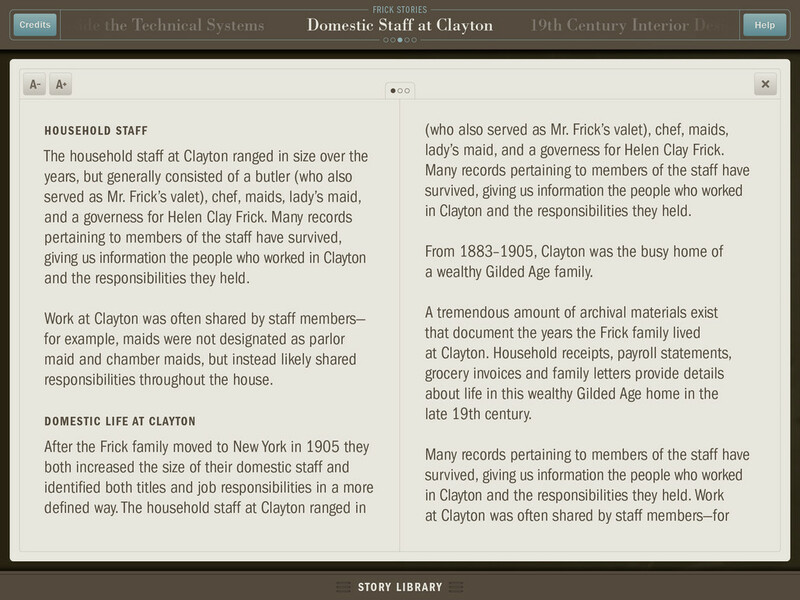 Stories with longer sections of text could be read in an optimized "reader" layout, with text enlargement controls. A story featuring two comparative objects. Images can be enlarged and manipulated. 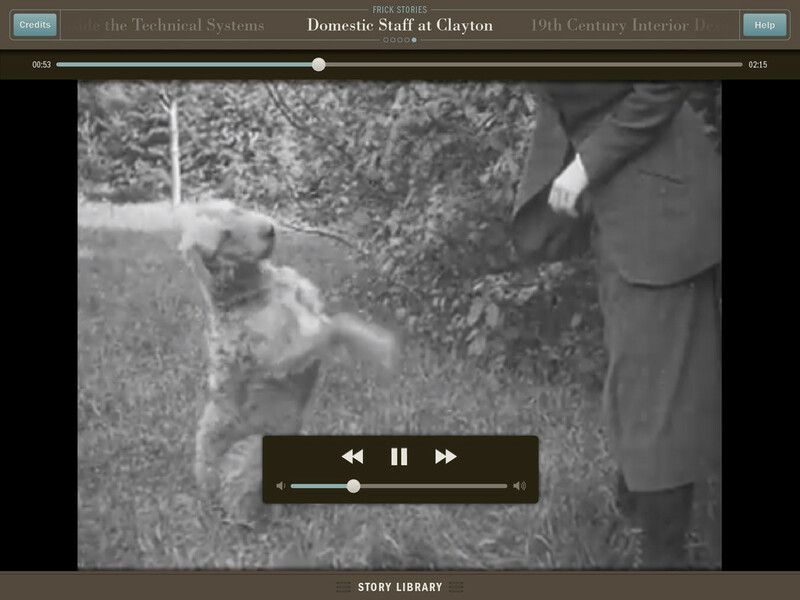 A story featuring archival video content. 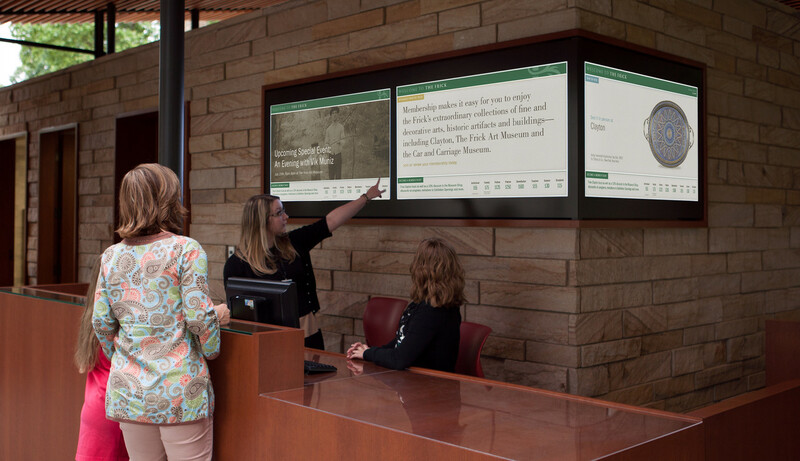 Belle & Wissell worked in close collaboration with the team at The Frick and Schwartz/Silver Architects to craft a series of digital experiences that integrate into the new Orientation Center at their site in Pittsburgh, PA. 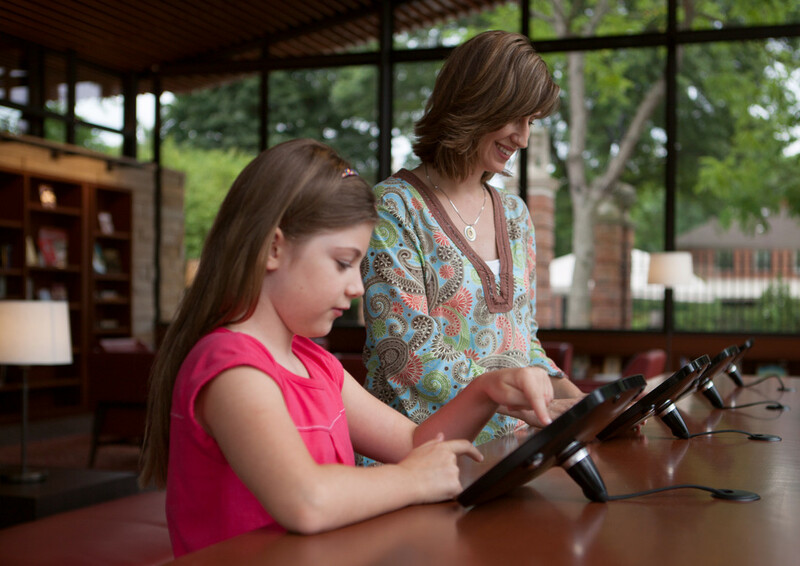 The Orientation Center is the hub of the site that includes ten buildings and expansive grounds and gardens. 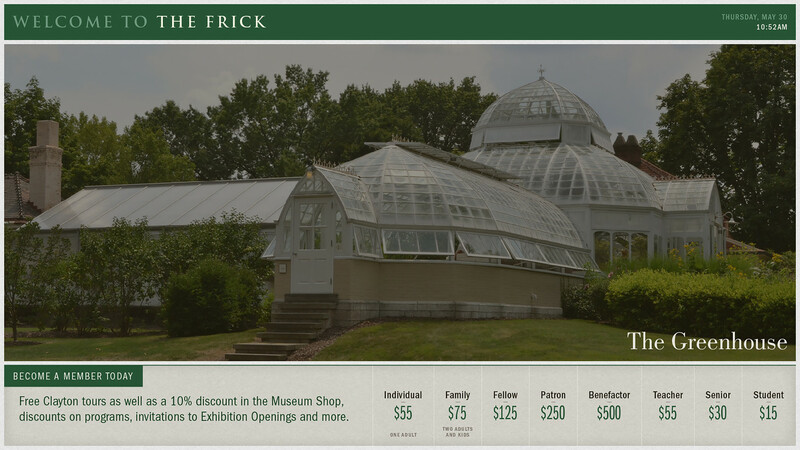 As visitors enter the building, they are greeted with a large, dynamic, three-display experience (Frick Multiplex) that wraps around the central stone wall; it displays ticketing and membership information, a real-time events calendar, and large imagery promoting special exhibitions, programs, events, collections, and retail offerings. 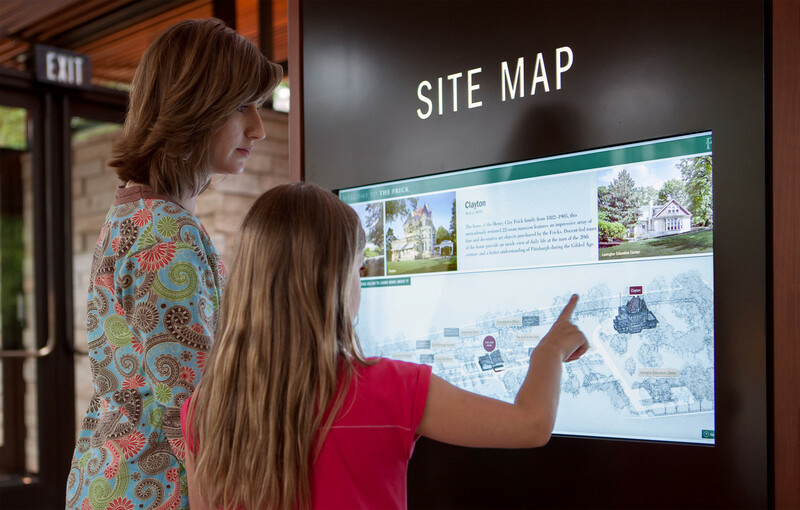 In the center of the building, there is a double-sided Interactive Map that features the distinct offerings available at the site. Visitors can touch a building they’d like to visit, and see the route and estimated walk time from the Orientation Center. Architectural information is also presented for the selected building so users can quickly learn about the building and what is on view inside. 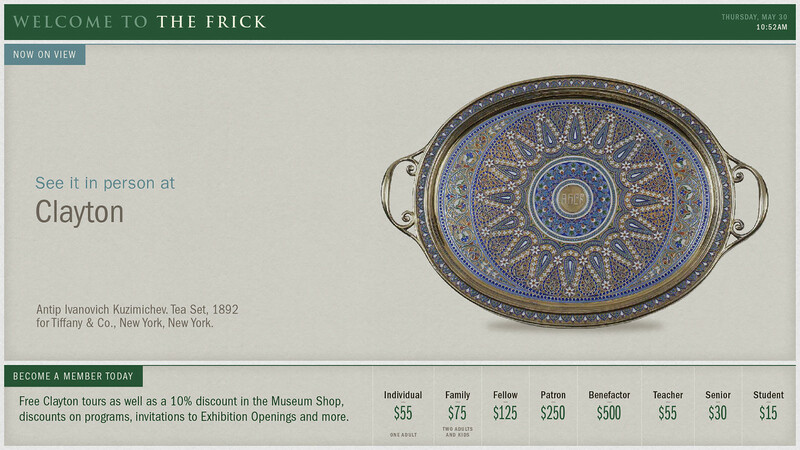 The Collection View Touchtables showcase a unique look at the collection of The Frick. Objects from the collection are presented in unconventional categories that encourage dialogues and comparisons between objects. 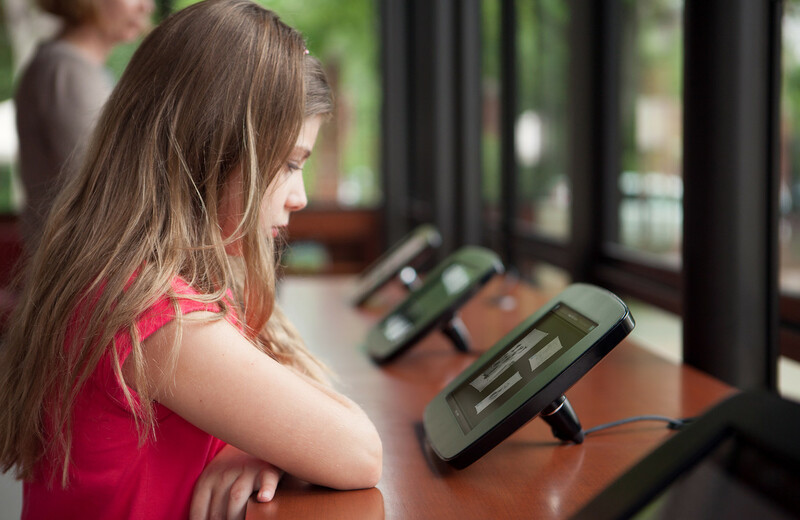 The experience is both visual and tactile and facilitates visitors being able to playfully manipulate objects and share them with their friends and family. 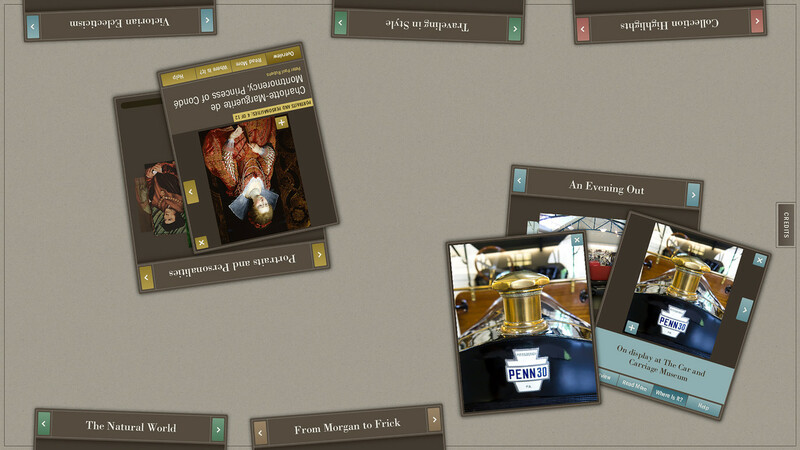 It also serves as a way to see objects that aren’t currently on view. 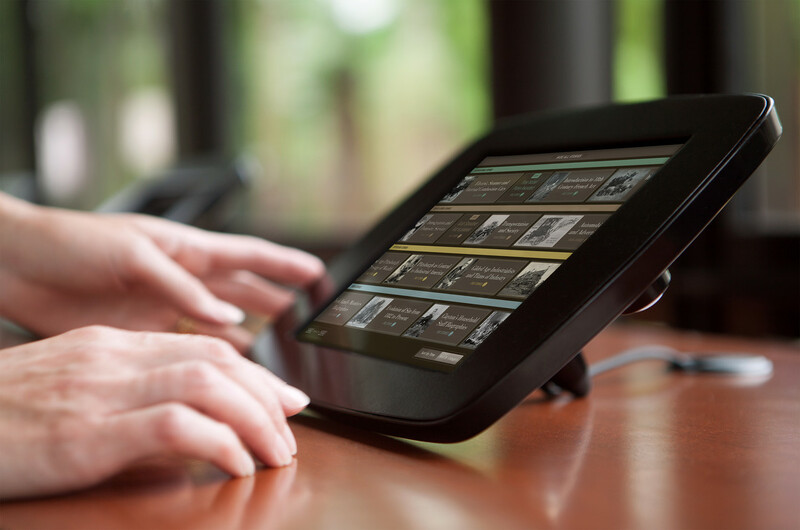 The final experience is an iPad bar that contains four Story View Interactives. 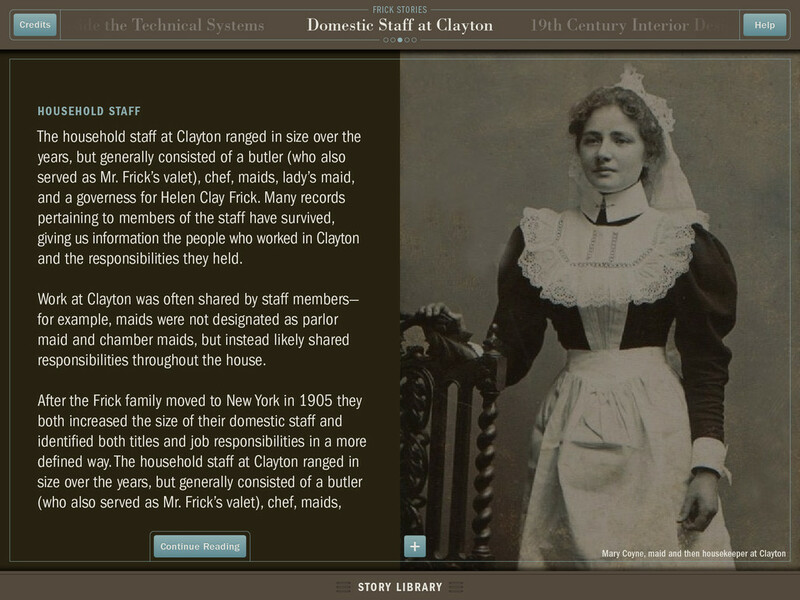 Stories are constructed around events happening internationally, nationally, in Pittsburgh and related to the Frick family story. 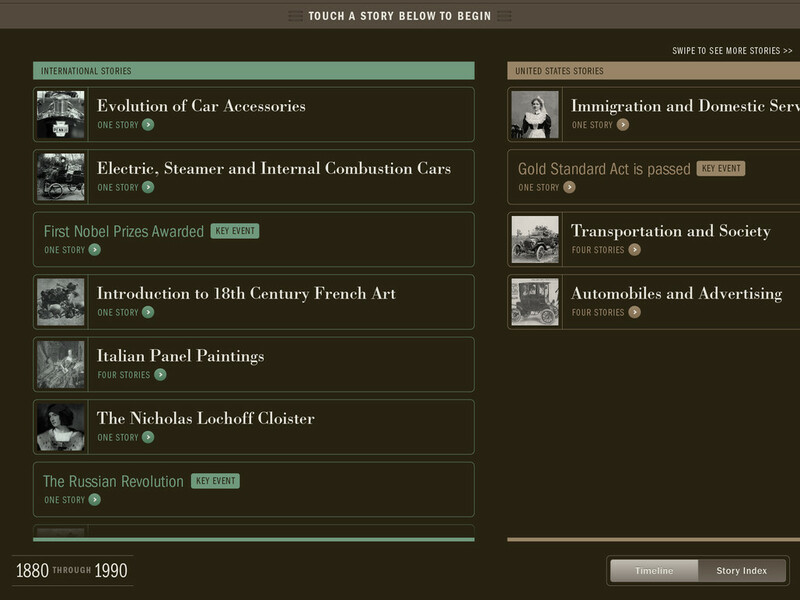 A series of layout types lets the stories be constructed in a way that can best feature objects from the collection.